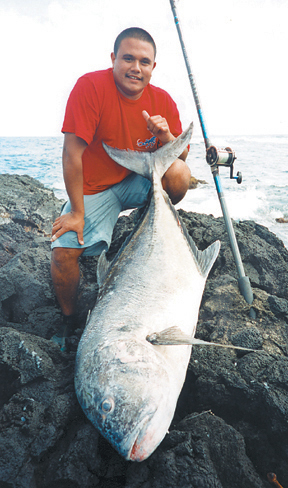 Kyle Saplan was fishing for small game when he hooked this 110-lb giant trevally. He had left his big game poles at home and was using a 13-foot Nitro pole, a Newell 454 reel and 60-lb test Ande line in their place. The equipment held together and he landed the fish of a lifetime!